Cats are great to have around, but people that have spikey babies rather than fur babies usually end up shopping for the same food. Surprisingly hedgehogs and cats don’t actually share many nutritional requirements. But fortunately, the pet food industry is so out of touch with what cat eats that they’ve created a few variations of the perfect hedgehog diet! To find the best cat food for hedgehogs you’ll need to know what hedgehogs eat, what they require nutritionally, and which type of food works best. We use these aspects to narrow down the wide array of cat food options to select the best cat food for hedgehogs. Looking at a natural diet for hedgehogs is the best place to start! In the wild, a hedgehog would eat mostly insects for protein and veggies or fruits that are native to their environment. This can include blueberries, cranberries, and root vegetables such as beets or potatoes. Starting with this we can see that hedgehog food might not immediately line up with cat food when it comes to protein. But, the vegetable and fruit additions to cat foods can make up the perfect macronutrient blend. When hedgehogs are out in the wild or rural residential areas, they’re well-known for sneaking into gardens. Ideally, a hedgehog should have food that has at least 20% protein, 15% fat and 5% or more of fiber. This macronutrient build will help them to have as close to a natural diet as possible. The 5% fiber content is the hardest to achieve through cat food. Unfortunately, many cat foods place the focus on protein exclusively and forget to control the fat and increase the fiber. The other thing you’re looking for in an ingredients list is “L-carnitine” which is essential for hedgehog health. Hydration is also important to hedgehogs as they don’t tend to drink water. This nutritional requirement can pose some problems because they do best with dry food which has no moisture. To help keep any moisture that you can in dry food, you should avoid dried fruits, seeds, and dried veggies. Because of the allure of premium wet foods, many hedgehog owners’ figure that wet food is best. But, your little guy has multiple sets of 44 teeth that need to stay sharp! That’s right. Wet food is rarely the best option for hedgehogs unless you supplement the wet food with hard and crunchy treats. When you’re looking at dry cat food for your hedgehog, you’ll need to ensure that it isn’t completely devoid of moisture. This need for moisture in dry food will naturally lead you to the premium dry cat food options. Keep in mind that most dry food that has some element of moisture will have a short shelf life. That means that you should prepare to purchase cat food for your hedgehog in smaller quantities and more often. With websites like Amazon or chewy.com, you can set up subscription shipping so that you can buy smaller quantities on your schedule without having to sign in to the website every time. These subscriptions also help reduce the risk that you’ll run out of food! Remember that hedgehogs are strong headed, and sometimes they’re just outright stubborn and might have a hard time transitioning to a new diet. Always stay patient and introduce new foods slowly! Purina has made outstanding food for pets for years now, and they’ve excelled in keeping recipes simple, and macronutrient builds valuable. The crude protein is 32% with 3% fiber and 13% fat. This blend is perfect for hedgehogs, and their hard kibble is great for their sharp little teeth. The kibble is the best part of this option because it’s incredibly hard but still has 12% moisture. The hard kibble helps maintain dental health, breaks down buildup between teeth and keeps teeth sharp. The kibble is also full of vitamin supplements which is an excellent way to make up for some of the nutritional gaps. The macronutrient builds that we were looking for isn’t found in this recipe although it gets extremely close. The 3% fiber falls short of our expectations, but the fat and protein percentages are outstanding. 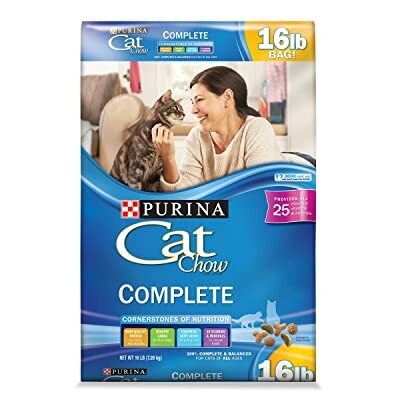 If you want to stick with the Purina Cat Chow Complete Dry Food option, you can, and your hedgehog will receive a wide range of valuable nutrients. But, to combat the lower volume of fiber, you should look into fiber-rich treats that you give your hedgehog between meals. Purina uses mid-quality ingredients but takes great care through their processing. Although this ingredients list holds fillers such as corn meal, and proteins like chicken by-product, it’s far from being a “bad” option. Purina takes great pride in ingredient transparency. With mixed protein ingredients such as deboned turkey and chicken as well as the fish meal the 40% protein build in this recipe is astounding. There’s also the addition of dried egg, concentrated pea protein, pea fiber, and flaxseed. These ingredients make up a high-quality recipe! The ingredients list is the best part of this recipe, and it hits on every mark that we were looking for in the best cat food for hedgehogs. The crude analysis shows 40% protein, 15% fat, and 4% fiber. Although we’d like to see more slightly more fiber, 4% is enough to get your hedgehog through the day. The moisture on this food is pretty low coming in at 10% and even though it’s a dry food recipe we usually expect to see about 12%. The 2% of moisture makes a huge difference! There’s also the downside that a lot of the nutrients are from supplements even though the ingredients list shows many vegetables and berries. The strong ingredients list is fantastic with proteins including turkey, chicken, egg, and fish. Then they use vegetables including pumpkin, carrots, and spinach. This combination of foods is outstanding. But, American Journey wasn’t confident enough yet! They use many supplements to ensure that your hedgehog will get everything they need. 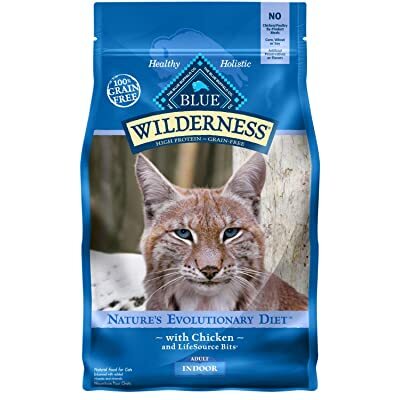 Blue Buffalo has crafted many exceptional recipes over the years, but this Indoor Chicken Recipe has everything that your hedgehog could need. The percentages for protein, fat, and fiber are amazing to fit a hedgehog’s daily needs. Without a doubt the blend of proteins, vegetables, and berries it outstanding. The ingredients list does include chicken meal but knowing that it’s from Blue Buffalo means that we know the meal itself is minimally processed with limited antibiotics or additives. The fish meals help boost the fat content as well as brings in Omega 3 and 6 fatty acids. The downside to this cat food formula is that the moisture is extremely low! Even for dry food, the 9% moisture means that you must help encourage your hedgehog to drink water rather than getting some of the moisture from their food. This food is so dry because of the use of dehydrated alfalfa. The Blue Buffalo formula can help you get your hedgehog on a nutrient-dense diet. But, that doesn’t mean that this is the only thing you’ll ever need to feed him. To boost the moisture in this recipe, you can moisten the kibble up with chicken broth or water. But, keep in mind that the more you moisten the food, the fewer benefits they’ll get from the hard kibble. Blue Buffalo creates high-quality foods and uses only high-quality ingredients. It’s just balancing the lack of moisture and the benefits of high protein and fiber contents that you have to worry about with this recipe. 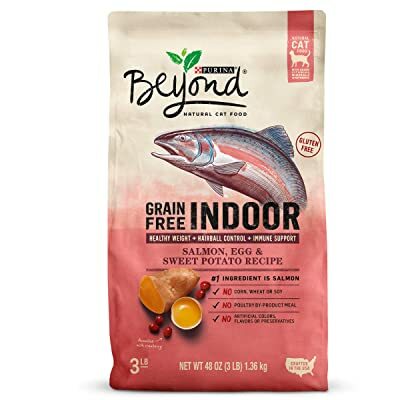 Purina Beyond Indoor Grain-Free recipes are meant to stand among the premium products and stand apart from the overpriced competitors that use lesser quality ingredients. Purina again makes a name for themselves with use only top-quality ingredients and reporting exactly what they use! The best part of this mixture is the moisture and fiber content. The moisture in this dry food Is 12% which is about average for dry food. The fiber content is the highest we’ve seen so far and is at 6.5%! That’s amazing when you consider that they’re relying on peas and sweet potatoes! There’s not much to dislike about the formula. Because of the proteins they use the crude fat content can vary by each scoop but typically ranges from 10-12.5% and even though this is a bit lower than we would prefer, you can always give your hedgehog tasty treats between meals. Overall if you’re new to hedgehog ownership, Purina Beyond Indoor Grain-Free Salmon Egg and Sweet Potato Dry Cat Food is a great place to start. 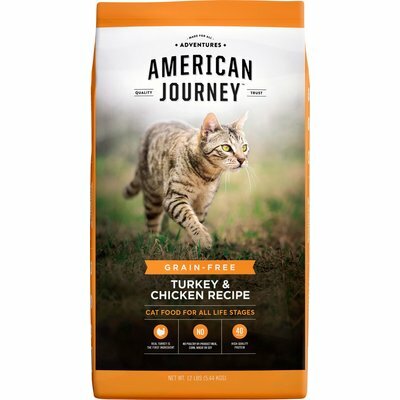 You’ll rest easy knowing the cat food is high in fiber and moisture while not lacking any major nutrients. The mix of proteins makes it a top choice among hedgehog owners because when you stick with only one protein, you can miss out on particular vitamins, fats, and fibers. Earthborn Holistic is well-known as top-shelf pet food, but that doesn’t always mean that they stand up to the competition regarding quality. The use of various proteins, vegetables and fruit are well worth the price. However, you will need to pay close attention to how much, and how often, you’re feeding your hedgehog because of the high-fat content. Earthborn uses every protein available excluding pork and beef. With the 3 different types of fish in addition to turkey, chicken and pea protein Earthborn hits all the marks! These protein blends are a great way to introduce a well-rounded balance of vitamins, minerals, and essential fatty acids. The high crude fat content (20%) is likely to leave you with a chubby hedgehog. Even if your hedgehog does have a lot of energy and is fairly active, chubby hedgehogs can quickly go from cute, to needing medical attention. Earthborn is an excellent brand, with a lot of high-quality ingredients in their recipes. But, if you’re worried that your hedgehog might be putting on a bit of weight, you should take great care in portion control. The holistic diet includes turkey, chicken, pea, potatoes, egg, herring, salmon, sweet potatoes, apples, blueberries, carrots and more. The list of ingredients is outstanding, but it does miss out on the essential fiber that hedgehog’s need. 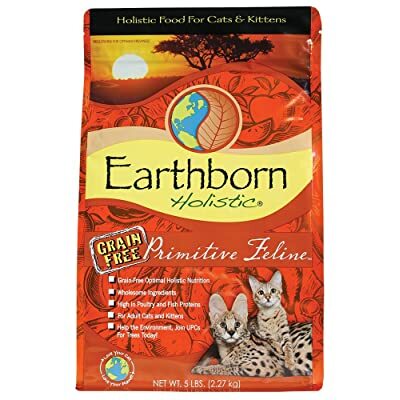 If you’re looking for a wholesome diet but want to use Earthborn, try fiber-rich treats! Without a doubt, the best cat food for hedgehogs is Purina Beyond Indoor Grain-Free Salmon, Egg, and Sweet Potato Recipe Dry Cat Food. This recipe uses a blend of proteins, vegetables, and berries to create a wholesome and nutrient diet that works perfectly for hedgehogs. If you’re new to hedgehog parenthood, having a recipe that’s as strong and high-quality as this one will help you make easier decisions on treats and even feeding times. You won’t have to worry about supplements, weight gain, or dental care! The hard kibble will help keep their teeth on point, while the moisture levels will ensure that they don’t get dehydrated, but they still need a water dish available! Finally, Purina Beyond won out because of the mix of ingredients. We mentioned this before, a hedgehog in the wild is not likely to use only one source as their primary diet. Purina Beyond searched for a variety of vegetables, berries, and proteins that worked well together for this formula.